Do your tile and grout need attention in your Northridge, CA office or Moorpark, CA home? Does your no-longer clean grout no longer resemble the color you worked so hard to choose? Don’t waste the weekend (or longer) at your Camarillo, CA home or Newbury Park, CA office on your hands and knees with a toothbrush. You’re not in the army! Let American Tile Cleaning show you what our tile and grout steam cleaning system can do. It’s simply amazing. American Tile Cleaning cleans tile and grout faster and better thanks to our state-of-the-art tile and grout cleaning machines, which are set at a maximum of 1000 psi. This gets rid of the dirt and grime on your ceramic tile floors, your natural stone floors and your fancy bathroom shower tile. You won’t need to buy area rugs to cover up that polished slate or marble in your Oak Park, CA office or those granite floors and granite countertops in your Thousand Oaks, CA home. Our tile and grout cleaner leaves no residue on the tile or grout. When you sweep your Mexican Saltillo or ceramic tile or floor in your Ventura, CA home or Oxnard, CA office, the crevice of your grout and the valleys in your tile capture fine soil, dirt, sand, grit and dust particles. As soon as you introduce water to your floor without removing all of these fine particles, the soil hardens and begins to attach to the various areas of your floor. Each time you repeat this process, your floor becomes increasingly stained. American Tile Cleaning returns your tile and grout to its natural, like-new quality. 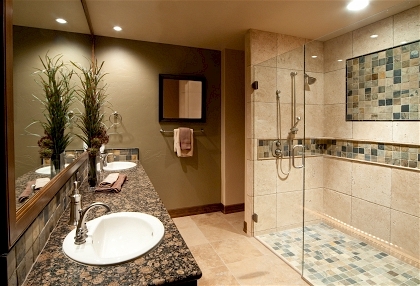 We also offer tile and grout sealing services. The tile & grout floor absorbs the sealer into its pores, creating a barrier against future staining. The sealer does not change the appearance of the ceramic floors by adding a shine or luster. Instead, it preserves the natural beauty of the polished marble or natural stone. Look for our tile and grout cleaning coupons for additional savings. © 2018 American Tile Cleaning. All Rights Reserved.